Iranian Minister of Petroleum Bijan Zanganeh says the Islamic Republic supports any potential measures aimed at restoring stability to global oil markets, implying, however, that oil prices should be set at reasonable levels. 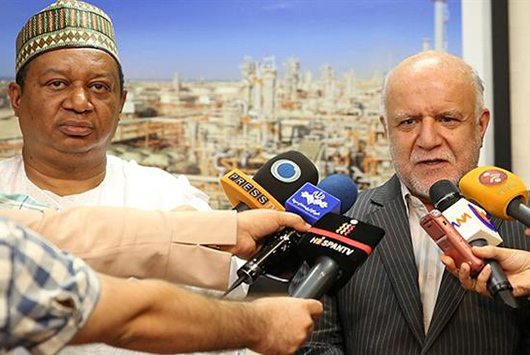 After an important meeting with visiting OPEC Secretary-General Mohammed Barkindo in Tehran on Tuesday, Zanganeh said most OPEC member states support oil prices at between $50 and $60 per barrel. He said $55 per barrel would be reasonable, and said, “Such a price would make oil production cost-effective and beneficial for the OPEC members besides generating satisfactory revenue, and would also prevent their rivals from [unduly] raising production levels,” Zanganeh said. Oil-exporting countries have been seeking a deal to cap production levels in an attempt to prevent a further drop in global oil prices, which in recent years saw a fall from a high of 147 dollars a barrel to a low of around 25 dollars. Saudi Arabia, however, has repeatedly hindered such a deal by insisting that Iran agree to the same low production level as that assigned for other countries. Iran has time and again said that it is prepared to join an oil freeze plan but has argued that any such deal should take into account the special position of the country, which had been under sanctions impacting its oil production levels for a number of years. Iran has made it clear that it would join a deal to cap production levels only after its crude production and market share reach the pre-sanctions level. Russia, a major oil producer but a non-OPEC member, has supported Iran’s position. Elsewhere in his Tuesday remarks, the Iranian minister of petroleum said that during the meeting with Barkindo, he elaborated on the position Iran would take at the forthcoming OPEC meeting in Algeria and was briefed about the OPEC secretary general’s negotiations with other countries. The upcoming OPEC meeting will be held on the sidelines of the International Energy Forum (IEF) in Algeria on September 26-28. A key topic on the agenda of the talks — in which non-OPEC members will also participate — will be the promotion of stability in the oil market. Iran, which is OPEC’s third largest producer, has been ramping up crude oil output since a nuclear agreement between Tehran and the Group 5+1 took effect on January 16, removing obstacles in the way of more crude production.